I have lovely childhood memories of my mom reading books like Goodnight Moon and Green Eggs and Ham to me at bedtime. But when it was my dad’s turn, it was more of a battle. Literally. 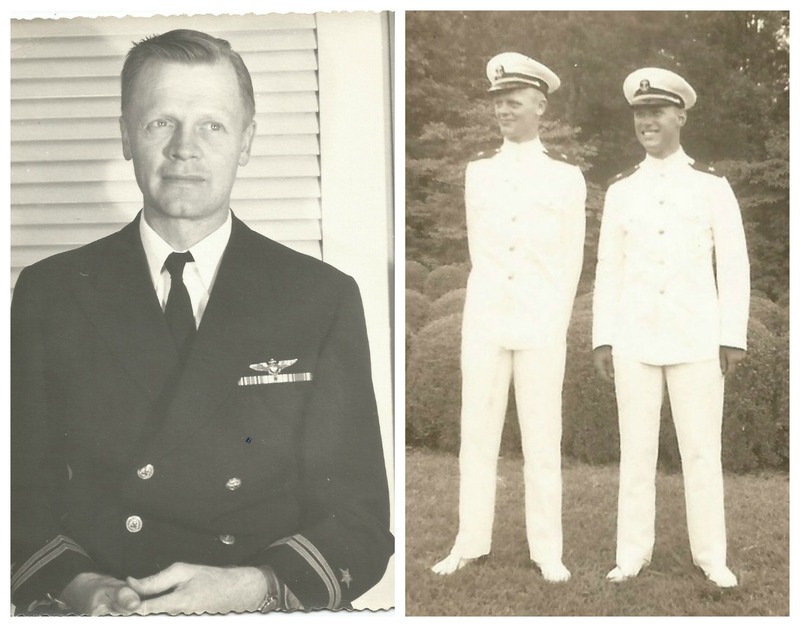 Having served as a torpedo bomber pilot in the U.S. Navy during WWII, dad lulled me to sleep with war stories about his missions in the Pacific or the time he had to make an emergency landing because his engine caught on fire. My dad’s military service, which totaled more than 20 years — active duty and time in the reserves combined, has always been a great source of pride for him. 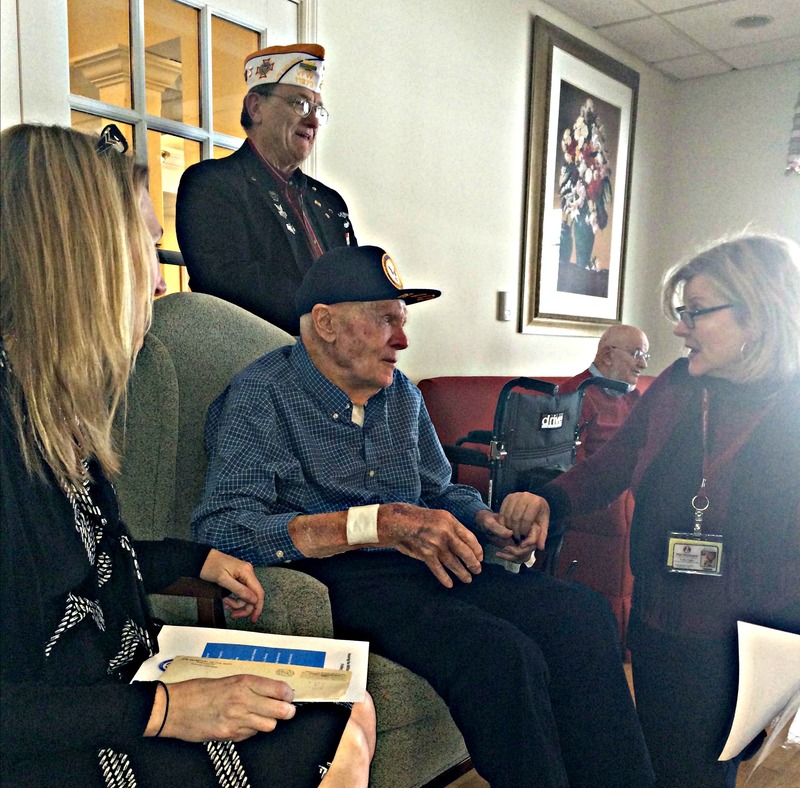 That’s why I was so thrilled when We Honor Veterans, a program of the National Hospice and Palliative Care Organization (NHPCO) in collaboration with the Department of Veterans Affairs, recently honored him with a recognition ceremony. The event was organized by Sandy Duggan, a volunteer and chair of the We Honor Veterans program for Home Health and Hospice Care in Merrimack, N.H. Dad’s event was just their second official ceremony, and it was planned to coincide with my monthly cross-country visit as well as his 93rd birthday. It came together quickly. I had considered waiting so that more of our family, including my husband and son, could be in attendance. But then I decided it was important to do it as soon as possible. Dad has been part of the HHHC hospice program for several months and he has dementia, so I wanted to give him the opportunity to be as healthy and aware as possible when receiving this honor. Dad has good days and bad, so just to be safe, we initially planned to hold the festivities in his room at the retirement community where he lives. But as word spread and the guest list grew, we took a gamble and moved the party to the large sunny parlor down the hall. I hoped he would be awake and interested in participating when the time came. I breathed a sigh of relief when he made it to the room and was transferred into a wingback chair, flanked by Navy veterans. But did he know why he was here? Did he realize this military celebration was for him? 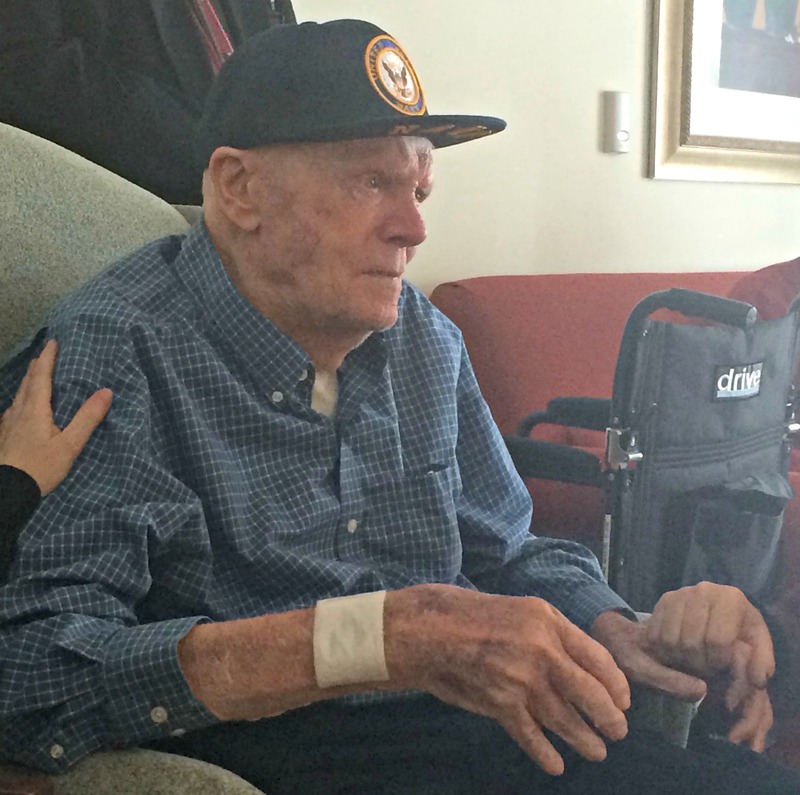 As the Home Health & Hospice Care Wellspring Singers began with “America the Beautiful,” his smile flickered on and off. 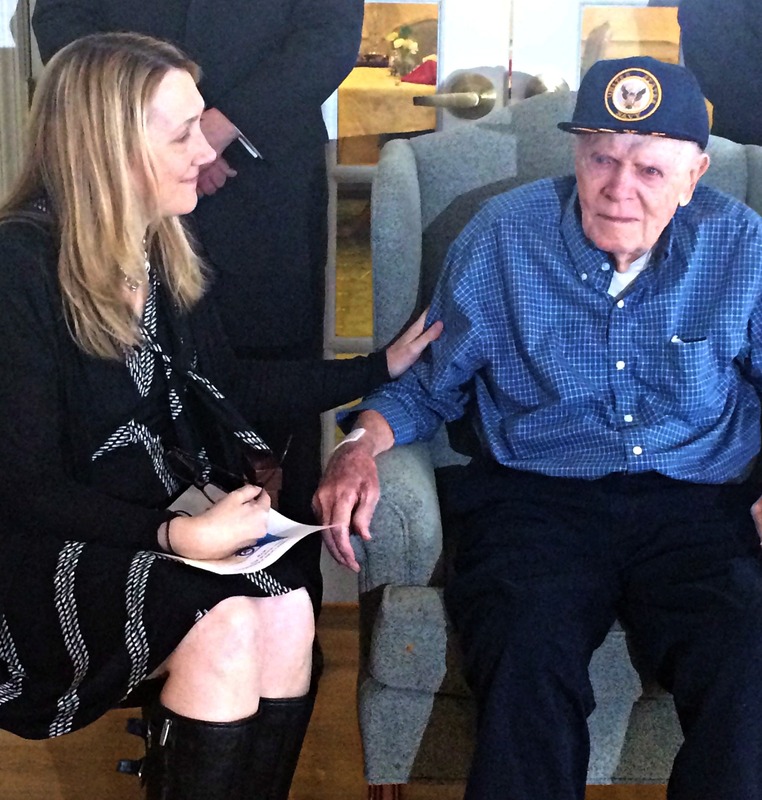 He listened attentively as fellow WWII Navy veteran Preston Walsh, a member of the VFW in Hollis, N.H. read a list of his accomplishments and thanked him for his service. But it was when event organizer Sandy Duggan knelt beside him that I saw it was all sinking in. Before she placed a pin of appreciation on his lapel, she looked him in the eye and explained that everyone in the room was there to honor him for his service. She told him how much he was appreciated. His eyes welled with tears and so did mine. His love for his country and military pride were still present, if only for that moment. As part of the ceremony, I read a letter from the Secretary of the Navy written to my dad in 1945. And one of dad’s caregivers, also a Navy veteran, shared his thoughts about my dad’s service. The ceremony concluded with rousing renditions of “Anchors Aweigh” “When the Saint Come Marching In,” and “Happy Birthday.” And then, as is the case with any fine celebration, there were cupcakes. Lately, I know my dad doesn’t always feel like a giant. And I think he and I both miss the power and authority he used to wield before dementia took hold. But this was a mighty day for dad, when we all got a glimmer of the officer and gentleman that he once was and always will be. And for that I am forever grateful. Check out honoring veterans for more information about the services hospice offers to recognize the men and women who have served our country. Thanks, Sanora, for reading and for your sweet comment. I am so grateful I got to experience this with my dad and to write about it. It really is an amazing program and I’d like to get the word out! Wow. Just wow. What a beautiful and touching tribute to your dad – both past and present. The photos are great – looks like he could still take a punch to the chin and not feel a thing (not that I am suggesting you punch your dad in the chin). Aww … thanks. Yeah, he’s a tough guy for sure, but totally a softie at heart.